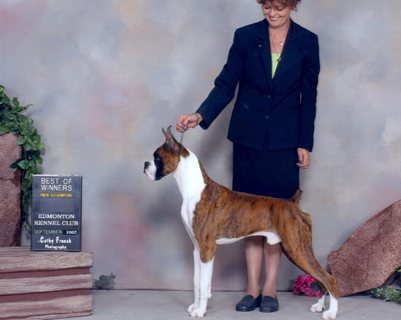 Lennon's championship picture with handler, Shannon Scheer, in Edmonton. 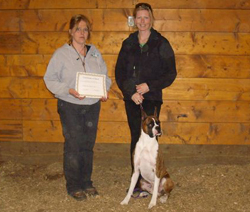 Titles: Canadian championship and Herding Instinct Certificate. Health: Eyes CERF normal, thyroid normal, and heart: SAS clear and one 24-hour holter monitor test (Feb 2010 = 15 VPCs). Hips OFA fair. Arrhythmogenic Right Ventricular Cardiomyopathy (ARVC) = heterozygous. Degenerative Myelopathy (DM) carrier. About Lennon . . .
Lennon is a happy go lucky fellow who will do anything for Natasja. 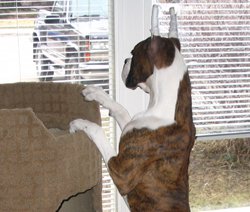 Like most boxer boys, he's big and sweet and goofy and ready for whatever Natasja wants him to do whether it is going to classes to learn to be a show dog or going to work with her for the day. We hear it from a reliable source that these two are inseparable! 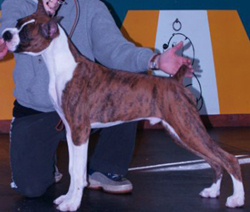 Lennon is a litter mate to Declan, Rooney, Abby, and Rocky who have all been showing in Canada. Lennon is the 7th champion for his dam. 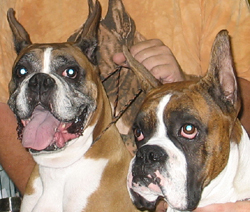 Lennon's first litter was born on 11 April 2010, consisting of one male and six females (four brindles and three fawns). 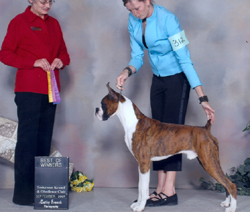 He was bred to Ch CanHar's Canadian Klassic, a fully-health tested, black-faced fawn bred and owned by Tammy Harris-Coates of AuTam Boxers. Lennon’s show career . . .
Lennon has gone to conformation classes with Natasja, where she has worked very hard to train Lennon so that she can show him. Together, they have done very well and we are very proud of them and what they have accomplished as a team. 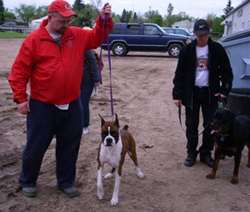 On 04 May 2007, Lennon obtained one point for winner's male under judge Martin Doherty at the Hub City Kennel and Obedience Club dog show in Saskatoon, Saskatchewan. Lennon was owner handled by Natasja. 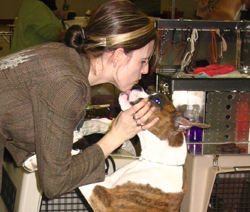 On 05 May 2007, Lennon obtained two points for winner's male, best of winners, and best puppy in breed under judge Nancy Popovich at the Hub City Kennel and Obedience Club dog show in Saskatoon, Saskatchewan. Lennon was owner handled by Natasja. 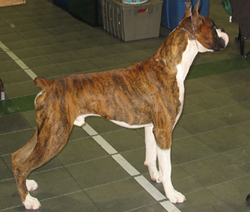 On 02 Sep 2007, Lennon wins winner's male and best of winners for three points under judge Dorothy Hood at the Saskatoon Kennel and Obedience Club dog show in Saskatoon, Saskatchewan. Lennon was owner handled by Natasja. 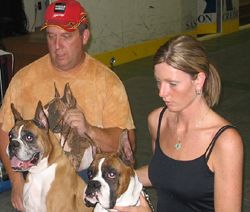 On 07 Sep 2007, Lennon wins winner's male and best of winners for 2 points under judge Judy McVeigh at the Edmonton Kennel Club dog show in Edmonton, Alberta. He was shown by Shannon Scheer. 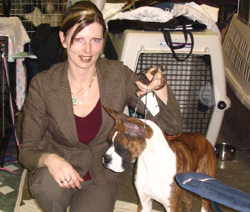 On 08 Sep 2007, Lennon wins winner's male and best of winners for 4 points under judge Susan Badick at the Edmonton Kennel Club dog show in Edmonton, Alberta. This win made Lennon a new champion! He was shown by Shannon Scheer. 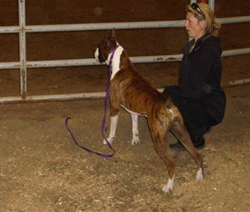 On 24 May 2008, Lennon earned his Herding Instinct Certificate with Natasja Fischer at Stettler, Alberta. 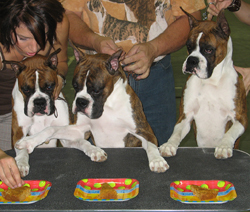 There were 40 dogs participating and the Tester / Evaluator was Tami Butterwick. Natasja described Lennon working the sheep as follows: "He moved those sheep like a true champion. He was silent, gentle and diligent! He had an absolute blast." 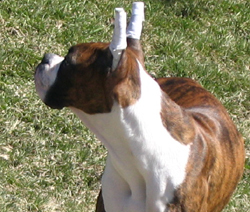 Lennon was the only boxer entered in the event and is the first Zaracon bred boxer to accomplish this! Lennon at various stages in his life . 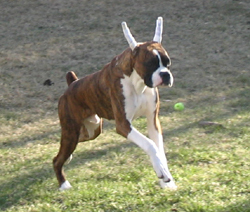 . .
Lennon running around his back yard. Lennon showing off his side profile. Where's the cat, inside or outside? Lennon at handling class learning to stack and bait. Lennon and Natasja at their first show. Lennon and Natasja almost ready to go into the ring. Lennon BOW in Saskatoon with Natasja handling..
Lennon working with Natasja at Saskatoon show. Rocky, Declan and Lennon eat their birthday cake. Sawyer and Lennon together in Saskatoon. Sawyer and Lennon with Dave and Natasja. Sawyer and Lennon hanging out together at a show. Lennon on the look out for some sheep. Lennon awarded his Herding Instinct Certificate. 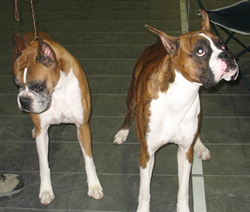 Lennon and Natasja at the Calgary dog show. Lennon waiting his turn to go into the show ring! Lennon posing with his grand-mother, Stella.